Set among the meandering man-made canals of Madinat Jumeirah, Jumeirah Al Qasr brims with Old World grandeur and feels like a royal palace because in many ways, it is. Al Qasr, which means “the palace,” is part of the impressive Madinat Jumeirah development, and the Forbes Travel Guide Four-Star getaway was built and designed in the image of a sheikh’s residence. 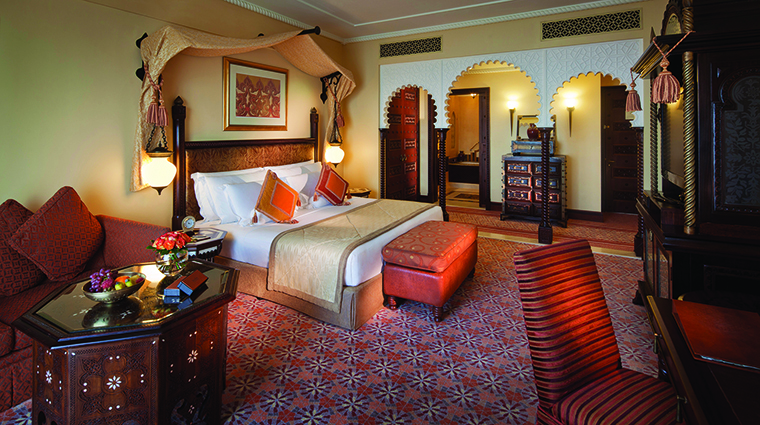 Escape into an Arabian fairytale in regal bedrooms complete with antique furnishings, scalloped archways, grand marble bathrooms and spectacular vistas of the lush manicured gardens or picturesque waterways. Elsewhere, on the property, enjoy a sprawling, indulgent spa; a private beach; and an overwhelming array of dining options. 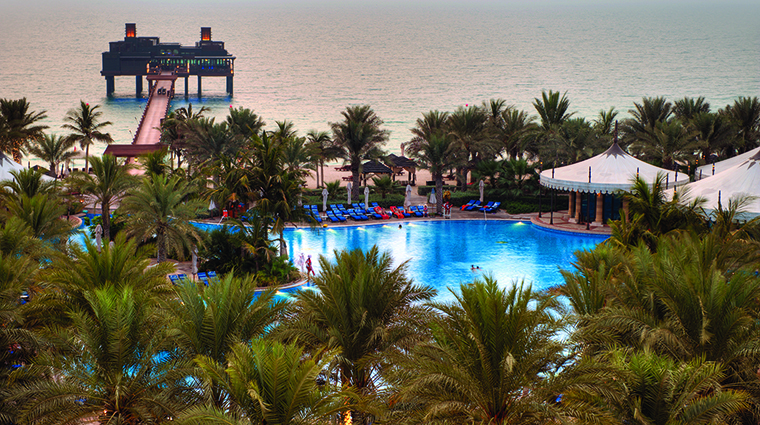 While the palatial charms of the Dubai hotel might keep you perfectly happy indoors, head to the mile-long private beach for sun and Burj Al Arab views. Fitness buffs can enjoy a one-of-a-kind workout at Talise Fitness, which boasts the UAE’s only High Altitude Suite. Take a high-intensity cycle class (after a few intro sessions, of course) in this unique low-oxygen chamber to achieve better results in shorter periods of time. At the Sinbad Kid’s Club, children can splash around in a pint-sized waterpark; join in fun games, crafts and activities; play sports; and watch movies all day long. 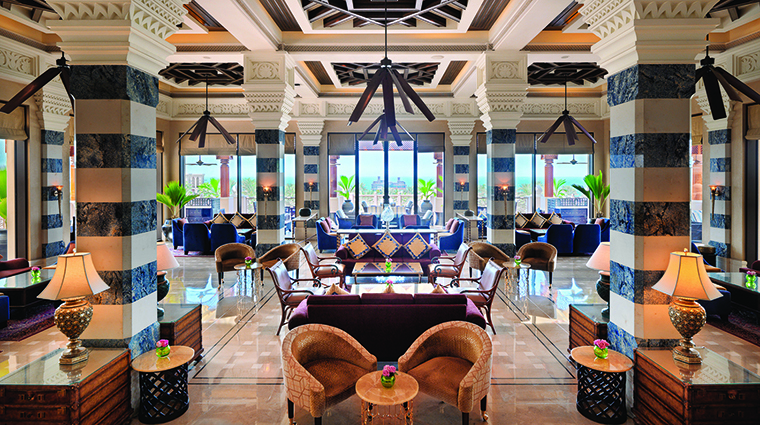 Apart from the eight restaurants, bars and lounges at Jumeirah Al Qasr, you’ll have an extensive selection of dining options around the Souk Madinat Jumeirah complex. Select from fine Italian cuisine and vintage wines, Asian soul food, Mexican favorites and more. What better way to relax than at Four-Star Talise Spa, a 26-room haven for deep-tissue massages, reflexology treatments, hammam experiences and a host of other face and body offerings. For Arabian-style indulgence, try the exfoliating 24-karat Gold Hammam. The hotel’s location in Madinat Jumeirah is possibly the best in Dubai, especially for those looking for a taste of the city’s finest dining, nightlife and live entertainment. It’s also within easy reach of the city’s major tourist attractions. Keep the whole family active with a visit to the resort’s Rock Climbing Wall. This 20-foot challenge with three rock boulders and a traversing section is suitable for both children and adults with varying levels of proficiency in the sport. Souk Madinat Jumeirah is built in the style of the city’s traditional architecture, complete with wind towers flanking romantic, winding canals plied by abra boats. Shop among the stalls and stores for souvenirs. Rooms and suites are spacious and designed with Arabesque flair and touches such as ornate columns, rich carpets with decorative patterns, arched windows, elegant mirrors, generous dressing areas and intricate woodwork. 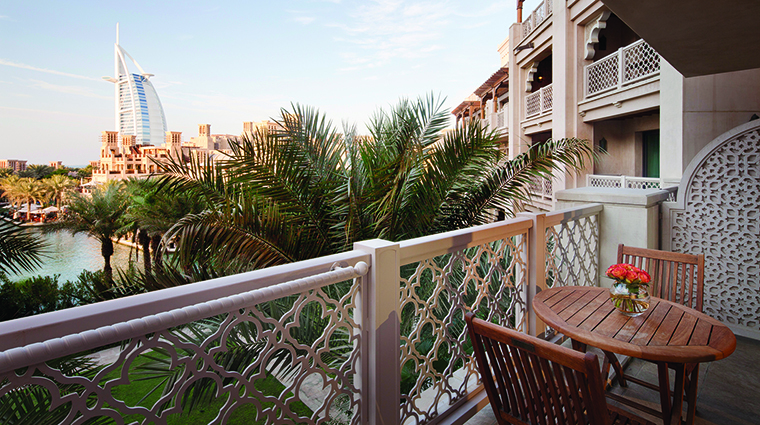 Private balconies offer scenic views of the canals of Madinat Jumeirah and the property’s verdant gardens. Marble bathrooms come with dual vanities, a bathtub and a separate rain shower. 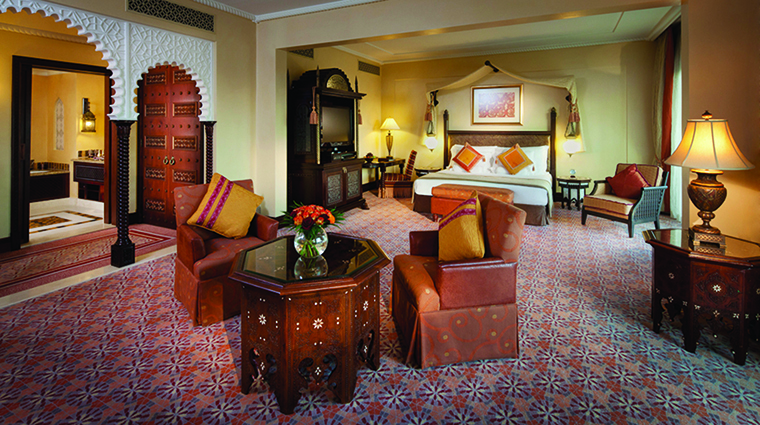 Enjoy the royal treatment when you book your stay in the palatial Presidential Suite. Situated on the top floor of the Dubai hotel, the 1,937-square-foot space boasts two bedrooms, two bathrooms with jetted showers and Jacuzzi tubs, three HD LCD televisions, a PlayStation, a home theater system and panoramic views of the entire property from a private terrace. Take an Arabesque-style afternoon tea at the elegant Al Fayrooz Lounge, along with Arabian-inspired accompaniments, such as strawberry kunafa mille-feuille and apricot orange blossom soufflé complete with stunning vista of the Arabian Gulf. Meat lovers will enjoy dining at The Hide, a modern take on the classic steakhouses of New York and Chicago. Sink into prime cuts and rustic sides in a trendy setting, or stop by for a sumptuous Friday brunch. Step aboard an abra and arrive by canal to the romantic Pai Thai to enjoy authentic Thai cuisine seated under the moonlight or inside the beautiful restaurant. You’ll appreciate the friendly, attentive service as much as the flavorful food — try the river prawns with creamy red curry, you won’t regret it. At Al Hambra, transport yourself to the Valencian tavernas of Andalusia. Authentic regional tapas, flamenco and the inspired décor create a one-of-a-kind experience in Spanish dining. Order specialties such as gazpacho, chorizo frito and rabbit paella along with a pitcher of some of the city’s best sangria. The catch of the day is always fresh at Pierchic, the luxury hotel’s Mediterranean seafood restaurant that delivers overwater dining with fantastic views of the Arabian Gulf. The stunning sunsets and cocktails make it a romantic (and popular) date night spot.